Fear, anger and suspicion rule the Donbass region in the east of Ukraine. All the fake news, spread through the social media, only makes things worse. Sergey Loznitsa shows how that is done. When war is called peace, propaganda is uttered as truth, and hatred is declared to be love, life itself begins to resemble death. 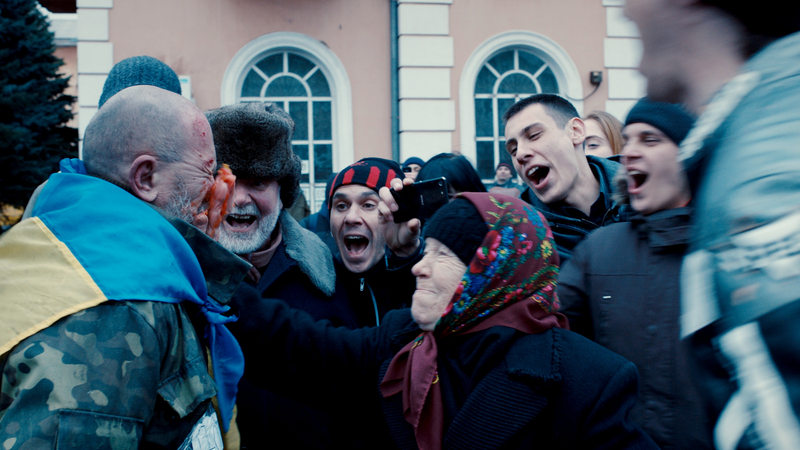 Director Sergei Loznitsa offers a "practical guide" to surviving this hell. In this specific case, hell is the Donbass region in eastern Ukraine, where criminal gangs, the Ukrainian army and Russian troops are fighting in the streets. Fear, anger and suspicion prevail, though what is real and what is fake news? Working with professional actors and Donbass locals, Loznitsa recreates social media videos to show that truth is often stranger than fiction. The film, which won the Un Certain Regard award for Best Director at the 2018 Cannes Film Festival, is an episodic fictionalization that highlights the grotesquery of strange and disturbing situations. Loznitsa presents a darkly comical portrait of a society in decline, as absurd comedy slips into absurd tragedy.